Alcyone is one of the main stars of the Pleiades cluster. 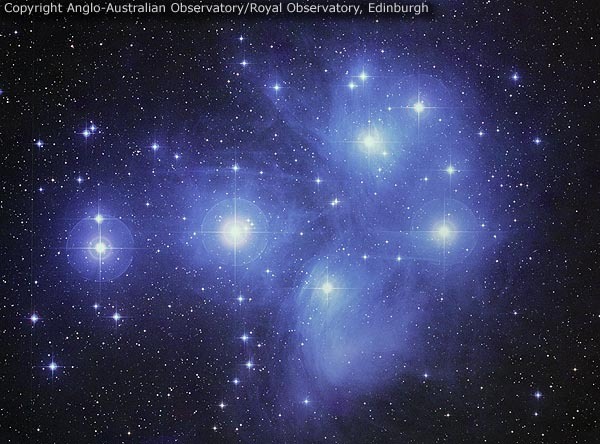 Alcyone is the brightest star of the Pleiades, and one of only nine stars in the cluster to have been given a name. Its official astronomical designation is Eta Taurus, and it's approximately 407.4 LY away. Appearance: Inhabitants of the Pleiades typically belong in the A1 classification: indistinguishable from humans. Most are of the Nordic type, though there are reports of 'red-head' and 'Mediterranean' types as well. Affiliation: Virtually all Pleiadians are generally considered to belong to the Federation. Alex Collier, however, claims that a break-away faction of Pleiadians with hidden agendas would come from the Alcyone system. Some Mayan legends refer to Alcyone as the 'Great Central Sun' around which our solar system would rotate. (But note that this last part, about our solar system rotating around Alcyone has been proven incorrect).